This is my first trip to Brisbane. My wife has got a job assignment and she has to go to Brisbane for a month. Since it coincided with school holidays and I can work from anywhere, we decided to tag along. We reached Brisbane Airport at 10.16pm on November 23rd after a 3-hour delay. The flight from Kuala Lumpur to Brisbane took 7-8 hours. My wife’s colleague’s husband Ben gave us a ride from the airport despite the delay. It’s very kind of him. The good thing about Brisbane is the airport is only 20 minutes from the City. Brisbane is 2 hours ahead of Malaysia so which is not too bad for us and we kind of adjusted to the new timezone the next day. Strictly speaking, Brisbane is not very huge and you can explore the city on foot. But with little feet around, you might consider doing it in a spread of a few days. 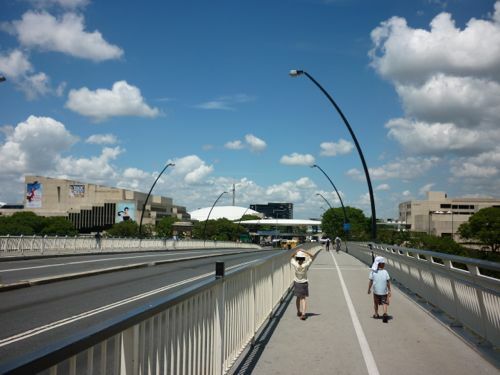 Walking is the best and healthiest way to visit Brisbane and any city for that matter. If you want to go to the suburbs (they are called urban villages) such as New Farm, West End, Kangaroo Point, and Spring Hill, it would be better to take a bus. Or you can take ferry to move about too. This is something not every city has to offer. To go even further, train is available. For example we took train to Alam Park Zoo and the ride is 45 minutes from the City. To plan your trip and what to take to get to your destination, and even how much you the fees are, go to Translink Journey Planner. Another plus for public transportation in Brisbane is you can get a go card and you are ready to use any mode of transport there. You get 30% discount on the fares if you use go card. Children below 5 do not need to pay. This is something I have not tried, but you can rent a bicycle from CityCycle (I guess it’s run by Brisbane City Council) which you can find all over the city. Generally people of Brisbane are super friendly. While walking, they can smile and say hello to you even they don’t know you. There is no problem to ask for directions or even strike up a conversation with them. Not to mention they are very helpful and polite. Despite it being Australia’s third largest city, Brisbane is not as hectic as other metropolitans – which I prefer by the way. 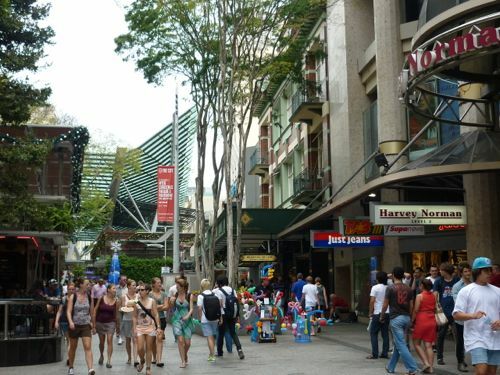 The CBD (especially Queen Street Mall area and its vicinity) is more lively and crowded on Friday nights when the people of Brisbane come out and have a drink and get together. You don’t need to worry about the safety in Brisbane. It’s a safe city even at night. 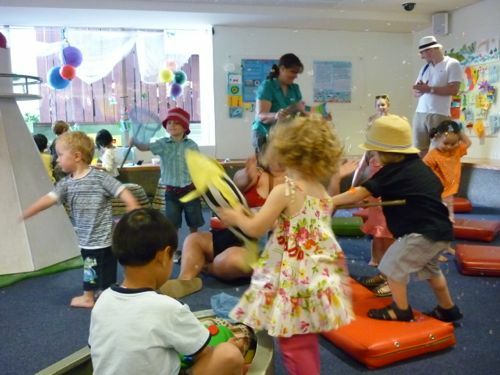 Here are the no-cost activities you can do with children in Australia’s third largest city. We woke up late on the second day. We only went out after late breakfast. At first I thought Queen Street Mall was a shopping centre. it’s not a mall per se but a street with two rows of shopping outlets – along a section of Queen Street – which is only accessible to pedestrians. The Visitor Information Centre is located here too. I am confident to say that this is the most crowded place in Brisbane – especially on weekend nights. Day or night, you can take your child to walk along Brisbane River. 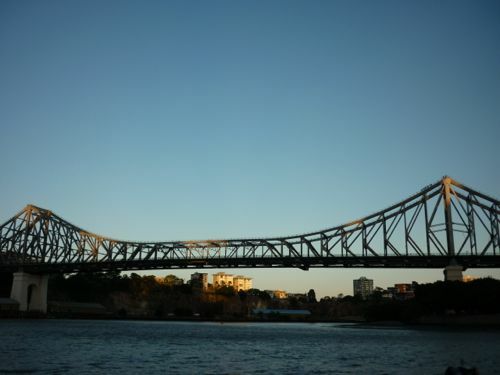 The view is spectacular and this is where you can have a better view of Brisbane’s icon: Story Bridge. I am not sure of the length of the riverside walkway but you can access it through many points. We went there through Eagle Street and near Customs House – which is just opposite where we stay. The Story Bridge has quite a spectacular view at night and makes it perfect for picture. If you are adventurous, you can cycle or jog there. The City has been treating its people very well. It offers not one but two free bus rides around the city: one clockwise and another anti-clockwise. The free rides are for everyone: residents and tourists alike. Of course we took advantage of the free bus rides. To catch a free bus, look for signposts that are red and wait for the bus to come and hop on. The free rides are perfect for tourists to go around the city and get down to the part of the City that needs more exploration. You can go to places like King George Square (and City Hall), City Botanic Gardens, Brisbane Square (and casino), ANZAC Square using the City Loop, just to name a few. We made a round trip of Brisbane CBD on the free ride (anti-clockwise) before getting down at City Botanic Gardens (Alice Street). The bus stopped just next to the entrance. 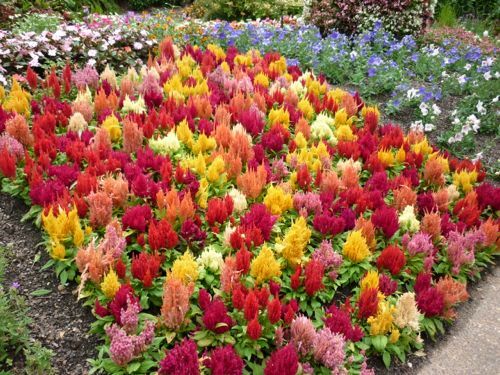 The City Botanic Gardens were started in 1855. Free guided walks are available from 11 am to 1 pm. We were in time for the last free guided walk. Guided walks (which last slightly more than an hour) are done by volunteers. Our guide did a very good job that day and his name was Remo. Remo gave us a tip that there’s a nice cafe in Old Government House. 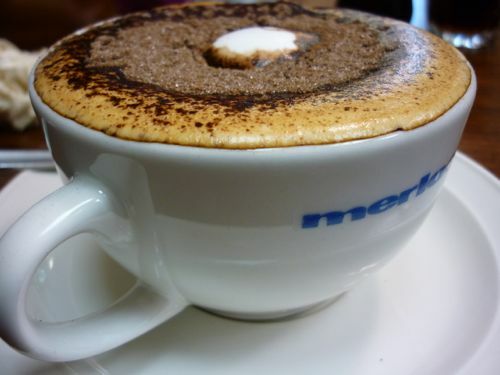 After the walk in Botanical Gardens, we had a break at Merlo Coffee. I ordered one cappuccino, chocolate muffin, and Coca-cola. Total bill was AUD$10.90. Since the first visit to City Botanic Gardens was in a rush, we made another trip to the 150-year old gardens. J and K were playing in the playground of City Botanic Gardens after we had lunch that I packed. I was still not used to the Australian recipes which are different from what I have back home. I need to learn to prepare food like sandwiches – no more noodles. Back to the playground, J and K were very happy playing in the playground even though there were not many play equipment there. They made up stories such as by pretending one of the equipment there in the shape of ship as CityCat of Brisbane. They kept themselves occupied for about 2 hours there. I almost fell asleep while waiting for them! 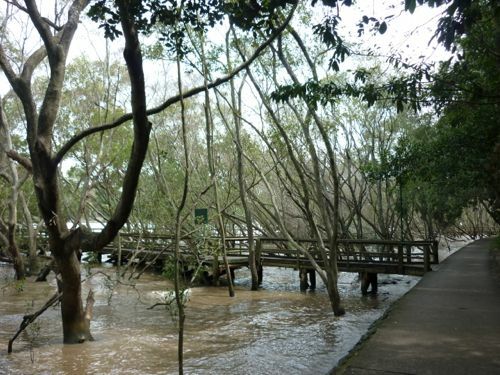 Then we moved on to the Mangrove Boardwalk of City Botanic Gardens – along Brisbane river bank. At the end of the park, there’s a pedestrian bridge that connects the city to South Bank. It is called Goodwill Bridge. We didn’t take the bridge as K was cranky and complaining that it was too hot and he was too tired to walk. Apparently going to a local market is one of the highlights of Brisbane trip. You can get almost anything from a market. And sometimes the stuff there can be cheap (but not always the case though). What I am interested in is local fresh produce: fruits and vegetables grown by local farmers. I am not interested in other stuff like clothes, handicrafts, or snacks. On Friday night, we walked to South Bank Lifestyle Market from our apartment on Queen Street crossing the Victoria Bridge. It was a long walk though. We were unsure where the Lifestyle Market was and almost gave up looking for it as it was quite far. Actually the market is located after QPAC, The Wheel of Brisbane, Griffith University, and Little Stanley Street. Products on sale are more on arts and crafts, clothes and accessories. We bought a lemon myrtle oil soap from one of the stalls. Next to the Lifestyle Market, one will find a row of nice restaurants. I must say this is one of the livelier part of the suburb. 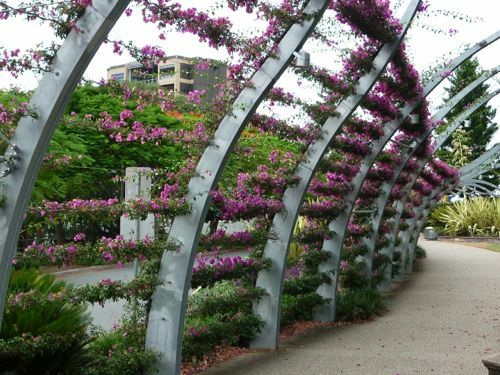 You can also take a stroll at the riverside (Clem Jones Promenade). It was very windy that night. We used Translink’s website to find out how to get to the West End Farmers Markets. Fortunately it was quite a straight forward journey as there was no transfer needed. What we needed was to take its City Glider bus at a bus stop on Adelaide Street – which is about 480m from where we stay. To use City Glider, we have to buy go card – a prepaid card issued by Translink that can be used on train, bus, and ferry. I bought go card with $20 value each – inclusive of the $5 deposit. The ride was about 10 minutes and when we reached West End Markets (located right next to Jane Street and Davies Park) it was packed with people. We spent quite a lot there as we stocked up our grocery supplies: fruits and vegetables. 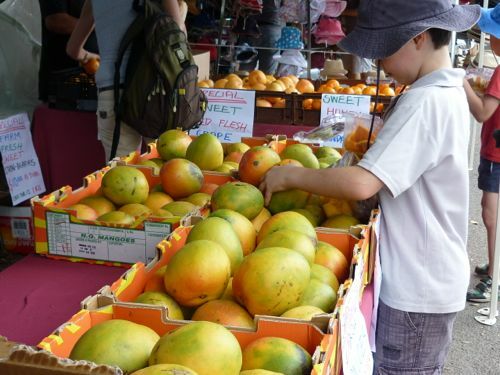 In season now are Australian mangoes ($2-2.50 each depending on variety) and stone fruits (yummy). We also bought macadamia nuts at $8 for a 250g pack. 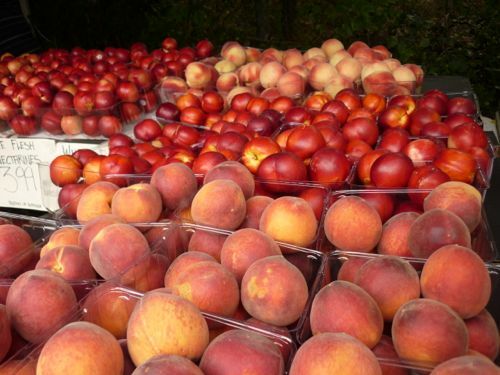 Plus apricots, peaches, cherries, oranges, nectarines, and avocados. We didn’t buy tropical fruits like papayas and bananas as I find them expensive compared to back home. 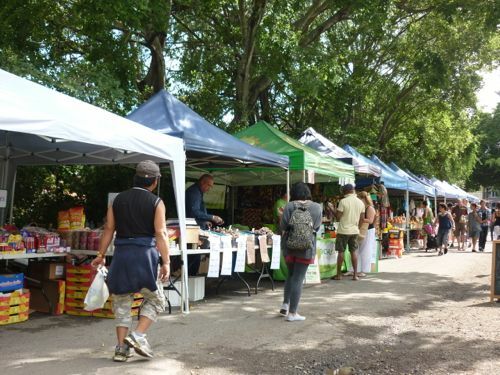 At West End Markets (also Davies Park Market), besides fruits and vegetables, you can get many other things: from poultry to seafood, from coffee to snacks, and from clothes to handicrafts. There was one coffee stall that caught my attention due to the long queue. I guess the coffee must be good. 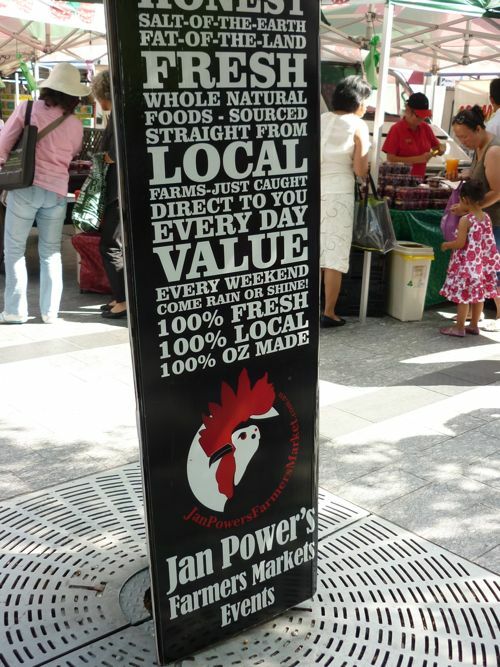 We again took the free bus to go to the Jan Power’s Farmers Market of Queen Street. The market is located on Reddacliff Place (bridge end) and the main products are fruits and vegetables while you can find also some other foodstuff such as snacks and nuts. We have found some great bargains on strawberries ($3 for 500g, $5 for 2 packets, $6 for 3). I asked for tasting of the strawberries but I was told there’s none left. Even without tasting the strawberries, I bought one packet to try. But after I made a round at the market and came back to the same stall, there were some strawberries available for tasting. The strawberries were okay though not very sweet (They were snapped up fast!). I told the owner I changed my mind and wanted to get another packet. Without hesitation, she was happy to offer me $5 for two packets. She didn’t even ask me to show “proof of purchase” and what I needed to do was to top up $2 for my second packet of strawberries. I also get some macadamia nuts ($13 for 500g). The market is on every Wednesday from 10 am to 6 pm. I went to Fortitude Valley by accident. I missed the bus stop that we were supposed to get down after the grocery shopping at West End Markets. 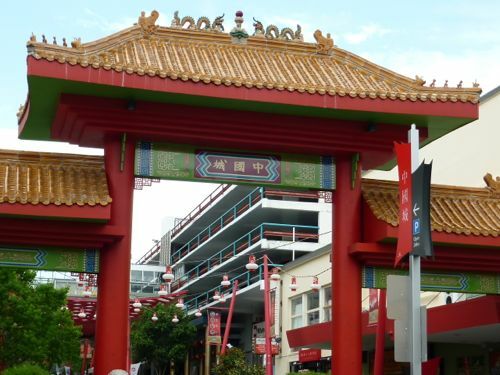 The nearest stop after that is Fortitude Valley – which is the Chinatown of Brisbane. Coincidentally, that was the place I planned to visit after lunch that day. Since we were already there, we lugged around with the heavy trolley bag that was full of fresh produce we bought from West End Markets and walked around Chinatown. We went to Chinatown Mall and Brunswick Street Mall that was lined up with stalls selling clothes, toys, used books, and even offering massage service. As the name suggests, you can get Asian food supplies (eg: noodles and soy sauce) in Chinatown. And if I crave for any Asian food, there are many restaurants I can go to to get my fix. We had our lunch at McDonald’s there before walking back to our apartment. Chinatown Brisbane is quite near to where we stay. It’s about 15 minutes’ walk. I am told that the “real” Chinatown is not in Fortitude Valley but in Sunnybank. Since it’s not walking distance from where I stay, I have not gone to Sunnybank to find out the “authentic” Chinatown. 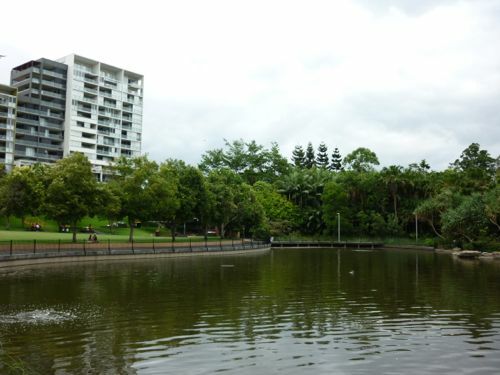 In the evening, we took CityCat – the ferry service – to New Farm Park. 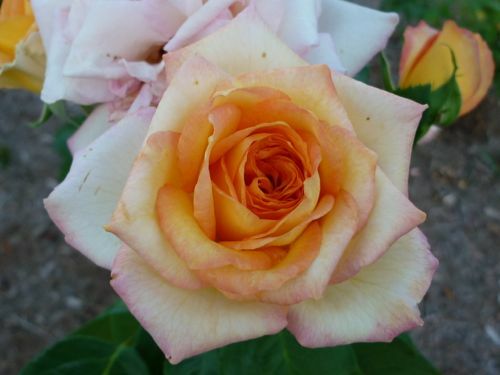 The park is huge and in the middle lie roses of different varieties and colors. It’s also a good place for a picnic and let the children run wild. It has a playground there too. Something children would look forward to. Old Government House (located next to City Botanic Gardens and Queensland University of Technology) which was formerly used by the governors of Queensland and their families. 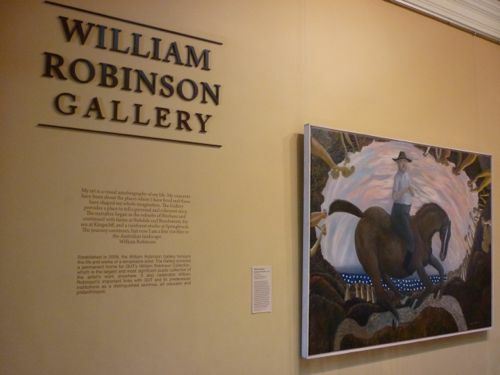 The 1862 building also houses an art gallery dedicated to Australian artist William Robinson upstairs. The admission is free and you have a chance to peek inside the colonial life of the early days of Queensland. We took the City Loop bus again to stop in front of the casino and walked across Victoria Bridge to go to the State Library of Queesnland. Though it was only 10 am, the weather was hot and the sun was glaring. I thought there would be a story telling session at 10.30 am but it was not effective until January. Fortunately there was a corner for children which is aptly called The Corner (on Level 1 and closes at 3pm). Over there children can make their own craft by using the materials provided by the library. At 11 am, there was a singing session that lasted quite a bit… one and a half hours. Later I found out that the singer is a recording artist and has his own album. Tim Jackman is wonderful and he is especially good at entertaining kids as well as adults. He sang many children rhymes and he even got the kids to get up on their feet to dance before he ended the singing session. 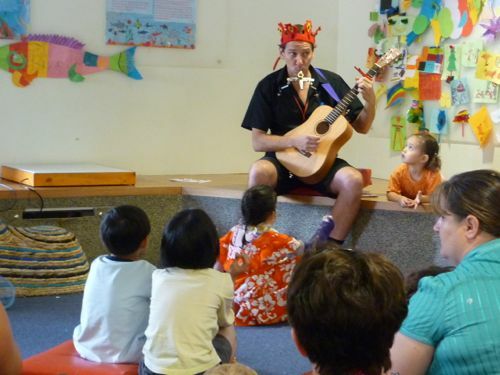 With just a guitar and kazoo, he kept the children entertained and hummed along. The place attracted many parents and children during noon. J and K were happy and enjoyed the session very much. Since the library was cold, we had our packed lunch outside the library. The idea of having packed lunch is still foreign to me. I have to search online to look for ideas what to pack for lunch when we are out and about in Brisbane. This is not something I am used to do back home but apparently this is a common scenario in Brissy, people just bring their lunch boxes and have them anywhere they like (as in the park, riverside, etc). Currently, there’s an exhibition called Look! The Art of Australian Picture Books Today. Exhibition featuring paintings from Australian children authors. It was fun for J and K. There’s even a section where the kids can create their own digital book using a touchscreen computer. When done, it could be saved and sent to your email. Adjacent to the State Library, Gallery of Modern Art is another great place to go for art lovers… and it’s free. GoMA provides free guided tours at 11 am and 2 pm respectively. But we toured the place on our own. The gallery has 4 floors and the place was rather cold and you might want to bring your sweater if you go there. You’ll find more than one exhibition at any given time and the themes keep changing. Most exhibitions are free. We decided to try a different route. Alighted at Alice Street in front of City Botanic Gardens (yes you guessed it we took The Loop bus ride again). 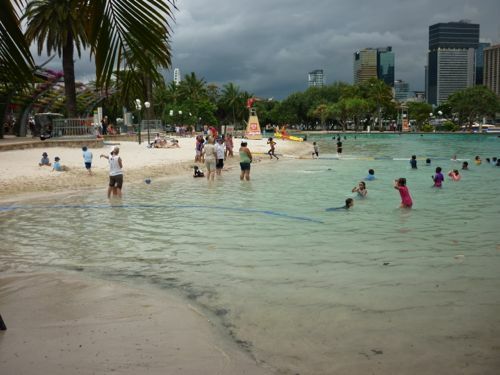 Our destination was South Bank Parklands and the pools and man-made beach. Instead of taking Victoria Bridge which we had crossed more than 3 times, this time we wanted to try out the Goodwill Bridge. While on the way there, we dropped by Parliament House (free admission) because I heard that visitors could tour the historical building. But when we reached we were past the guided tour at 10 am. The security guard told me that visitors were only allowed to enter the building during guided tours. So we didn’t manage to visit the Parliament House. We continued as planned to cross to South Bank via Goodwill Bridge. 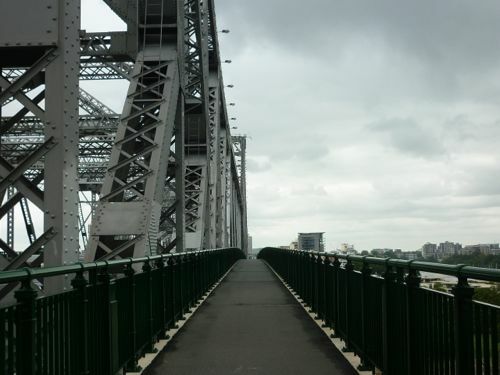 The bridge began operations in 2001 and it is only for pedestrians and cyclists – no vehicles are allowed on the bridge. 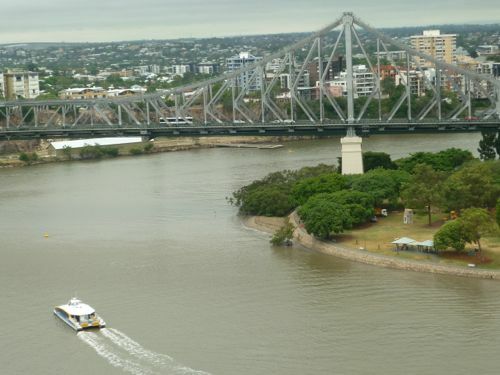 There are 2-3 lookout platforms for users to enjoy the scenery of Brisbane River. Right at the end of the bridge is where Maritime Museum is located. This is a paid museum: $8 for adults and $3.50 for children 5 and above. We didn’t go in. We proceeded to our destination. On the way, we saw a playground. We stopped there for a while. J and K loved it as the play equipment is different from what we have back home. Before J and K changed and went into the pool, we had lunch on the bench by the pool. 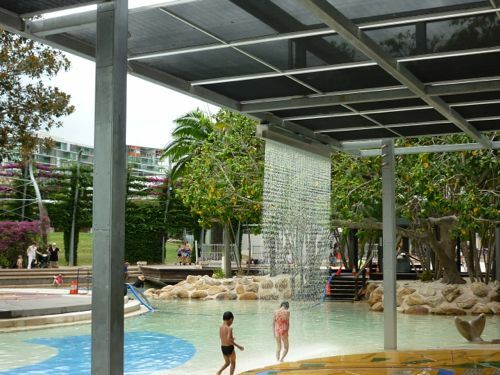 There are 3 different pools in South Bank. One for children (just like what you see in theme parks but smaller), another is Streets Beach – man-made inner city beach – divided into shallow and deep sections, and the last one is something like a swimming pool. All these pools are with lifeguards on duty. J and K couldn’t stay there long as it was rather cold that day due to cloudy and windy conditions. 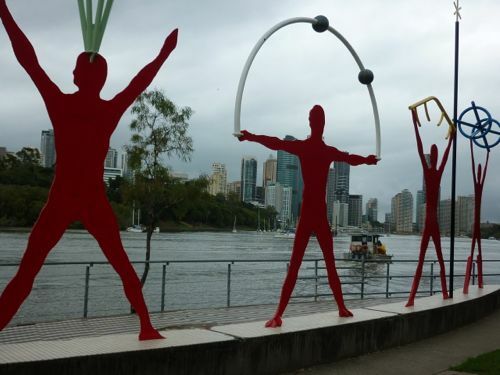 South Bank is an excellent place for taking a stroll on the riverside boardwalk along Clem Jones Promenade while enjoying the city skyline and cool breeze and of course Brisbane River. We walked back to the City Centre via Victoria Bridge. This completed a full circle: from Queen Street to Botanic Gardens and Goodwill Bridge. From South Bank to Victoria Bridge and Queen Street again (We took a bus back to our apartment on George Street). Money spent: zero. I am proud of J and K who made it albeit we took half a day to do it. To be frank, I was a little disappointed with it as I had the expectation that Museum of Brisbane would be a decent one. Unfortunately, there is only a small room dedicated to a currently going on showcase with slightly more than 40 items. That is it! I was told by the reception that there would be a new exhibition a week after and the current location is only temporary as a permanent site would be allocated for the museum in the City Hall building – which is not far from the current location. That might explain the size of the museum at the moment. We walked to Roma Street Parkland from King George Square. 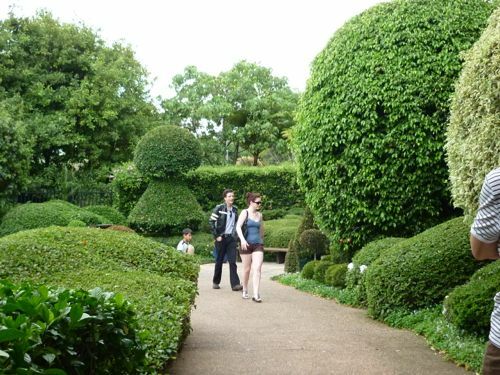 It is claimed as the largest sub-tropical garden in a city. 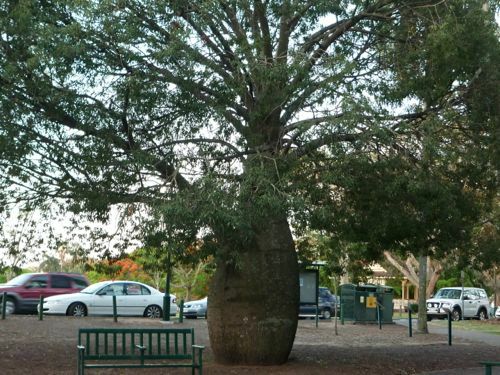 J and I found that Roma Street Parkland is better and nicer than City Botanic Gardens – though it doesn’t have the long history as Botanic Gardens do. 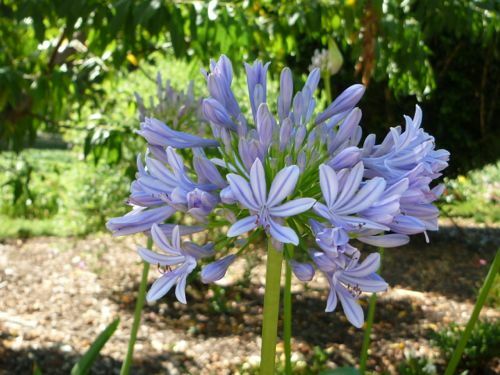 Roma Street Parkland has more varieties of plants: flowers, herbs, trees. Lake and fern gully form part of the 10-year old parkland as well. When we were there, many people (especially students) were savoring their BBQ food that they prepared using the public grill provided by the local council. Your child will like this. There are 3-5 kangaroos lazing around in the city. 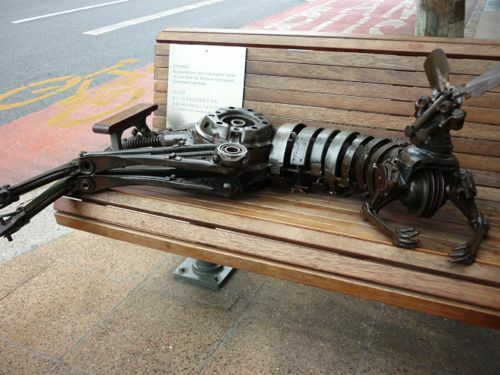 However they are not real but made of scrap metal. J and K were happy “playing” and taking pictures with these native Australian animals. These roos are located diagonally opposite Brisbane Square, between Queen Street and Adelaide Street. 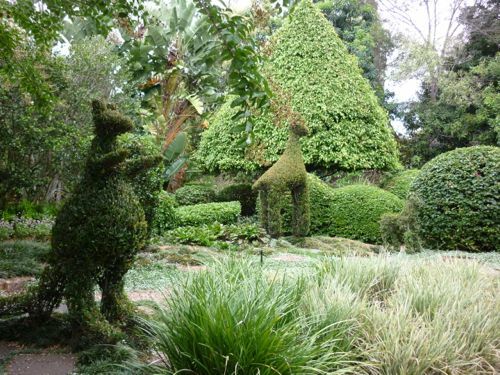 For the latest on what’s on in Brisbane, check out WeekendNotes. 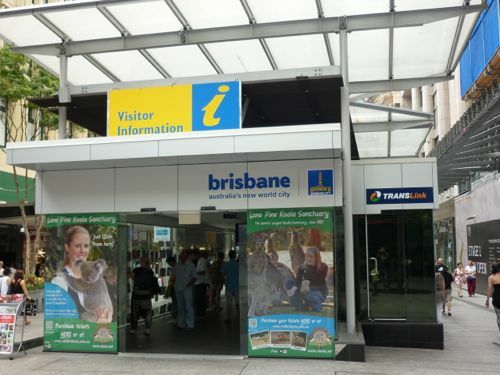 After I wrote the above post, we went to explore Brisbane further while we still had time. As you guess it, apart from the above, there are still more free things you can do with children in Brisbane. Here’s the update. We always passed by this place but never got a chance to go in. One day, we went to Queensland Art Gallery after a visit to the State Library. We just finished one floor and it’s so huge that we were tired by the time we finished that floor. J and K were complaining and we had a rest at the Library Cafe. The art gallery showcases many art pieces from local artists and it’s focus is on local history. 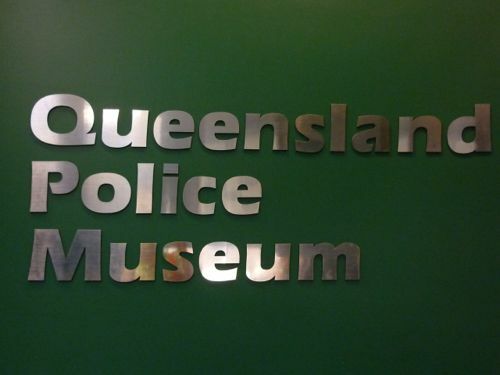 The Police Museum is in the building of Queensland Police Headquarters on Roma Street. The police have dedicated a section of the ground floor (turn right after entering at the main entrance) for this purpose. You’ll learn the history of police in Queensland, and how the police dressed in the old days. Plus if you are up to it, you can try your hand at solving some of the unsolved murder cases highlighted in the museum. A section of the museum might not be suitable for kids. Use your judgment accordingly as the police try to create a scene of a murder case in that section. Your kids will like this: there’s a police highway patrol motorcycle which you are allowed to sit on it and take picture. The lights on the bike will turn on when someone sits on it. However it didn’t work for either J or K. I guess they are too light for the sensor. Before the walkabout, I had warned J and K that it would be a LONG walk. They didn’t fully agree with my suggestion but I proceeded with the plan anyway. We walked along the riverside starting from Eagle Street and crossed the Story Bridge – near Medina Apartment. 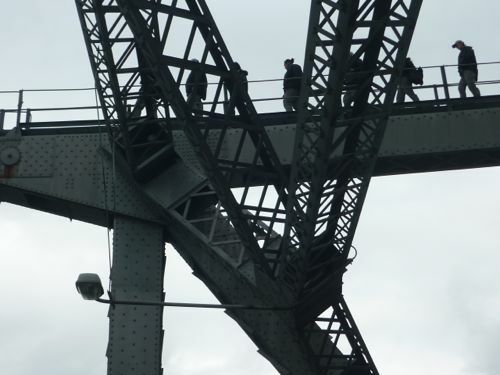 J and K were enjoying themselves on the bridge as we got the chance to view Brisbane skyline from a different angle. From the bridge, we could see our apartment clearly. In fact, that’s what kept J from getting bored during the walk. After getting down from Story Bridge, the first stop was C. T. White Park. J and K were playing there for a while before we walked to Captain Burke Park which is about 650m away. 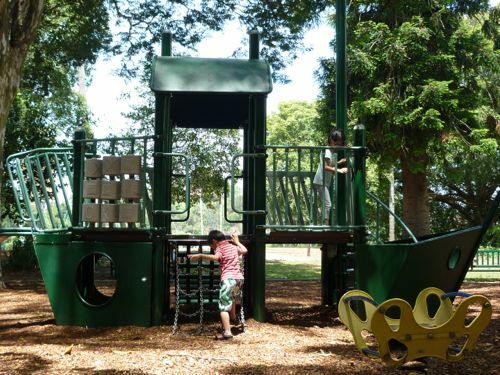 Playground and toilet facilities are available at the Captain Burke Park. The people in Kangaroo Point are as very friendly. They are smiling and say hello when they see you. We had lunch at the riverside – a veranda near Captain Burke Park. 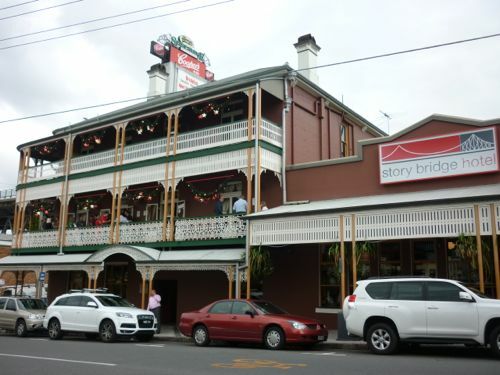 Then we walked along Main Street as we wanted to check out Story Bridge Hotel more closely. We continued our walk down to The Cliffs Boardwalk. 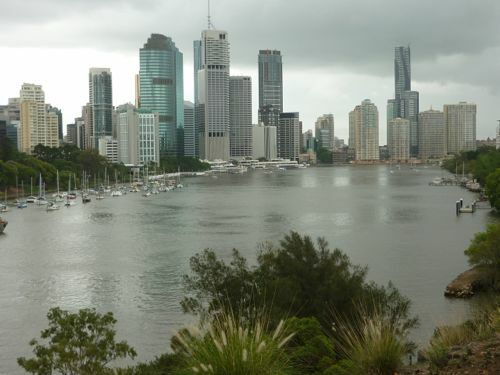 It’s the best place to have a nice view of Brisbane skyline from the other side of Brisbane River. We passed by Kangaroo Point Cliffs where there were a few enthusiasts were doing abseiling and rock climbing. We also climbed up the steps and took a look at The Cliffs Cafe. The cafe was full when we reached. There’re toilet facilities there too if you need to relieve yourself. We went down to the boardwalk again and continued the walk until we reached another lookout near Walmsley Street. You need to climb up some steep steps. I checked the map and there’s a park nearby called Raymond Park. I wanted to keep the kids entertained so I took them there. Near the park, there’s a hotel called Pineapple Hotel which was established in 1864. 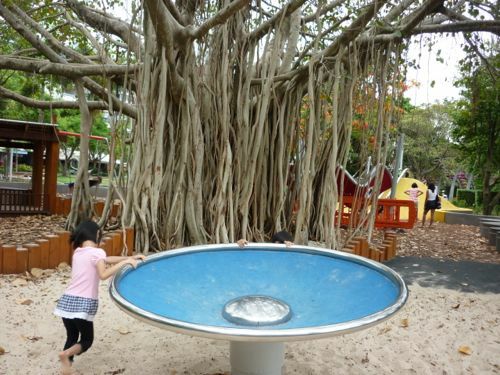 Next to Raymond Park is the Pineapple Park which has a playground. We spent about half an hour there before we headed back to the boardwalk again. We took pictures throughout the walkabout. We continued until we reached Goodwill Bridge and crossed over to the city on George Street to take the City Loop bus back to our apartment. It’s basically a round trip from Queen Street to Story Bridge (Ivory Lane) to Kangaroo Point to Goodwill Bridge to George Street and back to Queen Street. J and K didn’t complain except toward the end of the trip when K was getting tired. J was enjoying herself and she even suggested walking all the way back to apartment. But we didn’t as I was too tired to walk then!